On 10th and 11th September 2011, a series of protests will hit France nationwide with 100,000+ angry bikers expected to bring the whole country to a complete standstill. 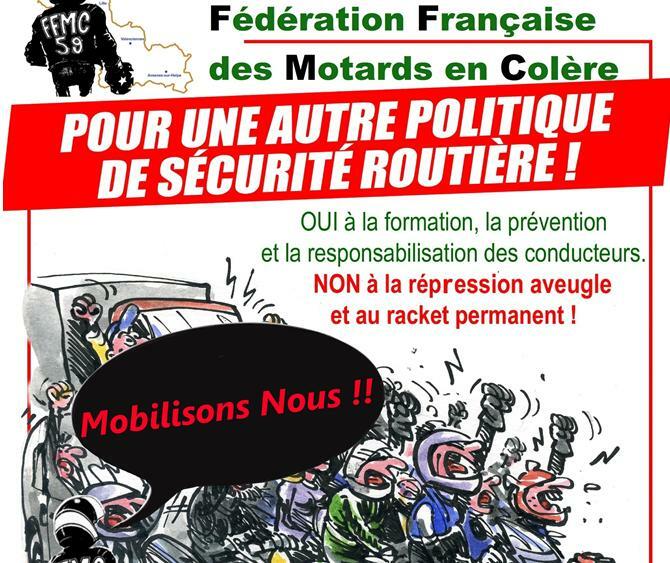 On 18 June 2011, the French government had a feel for what the bikers were capable of and the same bikers will repeat their actions on 10th and 11th September, in response to a government that continues to adopt a “can’t see you, can’t hear you” attitude. Click here for more details on the demonstrations that took place all over France on 18 June 2011. The angry bikers, called to protest by the Fédération Française des Motards en Colère (FFMC – French Federation of Angry Bikers), continue to oppose the compulsory wear of a high visibility fluorescent vest as a measure imposed by the French government to reduce the number of accidents involving motorcyclists. The bikers argue that the measure is a complete non-sense as accidents are largely caused by car drivers not watching out for motorcyclists on the roads and not being adequately trained to share the roads with them. The bikers also argue that the measure is proposed to enable the government to cash in thousands of euros a day from bikers who choose not to wear a high visibility jacket. The French government is accused of not being concerned about what bikers may wear underneath that high visibility vest for their own safety in case they fall off their bike. As long as they wear the fluorescent vest, that’s all what counts. Fancy joining the fun from the United Kingdom? And for those who don’t mind riding down to Paris, the meeting point is at 2pm outside Chateau de Vincennes. Bikers are required to organise their own travel arrangements to France and must bring with them a valid passport, motorcycle licence and insurance certificate that covers them outside of the UK. Also, we would advise all UK bikers to keep an eye on their speed, especially on motorways and main roads, as we expect very high police presence on the roads on 10th and 11th September. Click here for further details on speed limits in France and the consequences you may face if you exceed those limits. « France: A tsunami of angry bikers cause chaos again!